I also have used this on a strange bump on my child's lower eyelid (that the dr's prescription did not resolve). It only took one little drop one night and it was gone the next day. I have used it on an infected finger from a cut. Just wouldn't heal until I put it on, let it dry, put more on a bandaid and covered the cut. Infection was gone in 1 day. Very cool. Comments for Strange bump on lower eyelid gone! 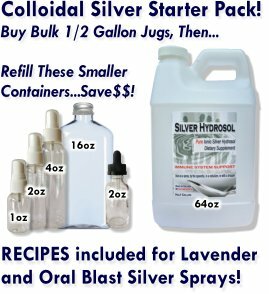 Thanks for sharing your testimonial about colloidal silver hydrosol! It always puts a smile on our faces to read about our customers' successes with our products! Our sincere intention is ALWAYS to provide an affordable AND effective product and you story helps us know that we are doing just that!